HIV (Human Immunodeficiency Virus) is composed of two strands of RNA, 15 types of viral proteins, and a few proteins from the last host cell it infected, all surrounded by a lipid bilayer membrane. 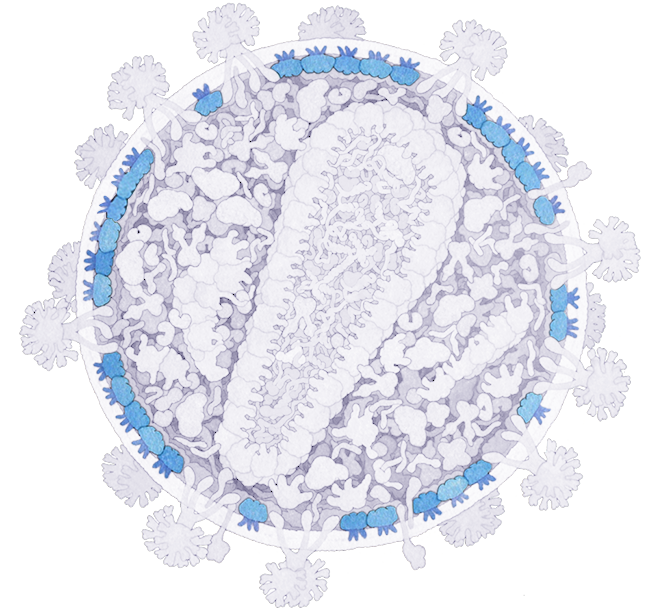 Together, these molecules allow the virus to infect cells of the immune system and force them to build new copies of the virus. Each molecule in the virus plays a role in this process, from the first steps of viral attachment to the final process of budding. Since 1986, research on the structural biology of HIV have revealed the atomic details of these proteins. 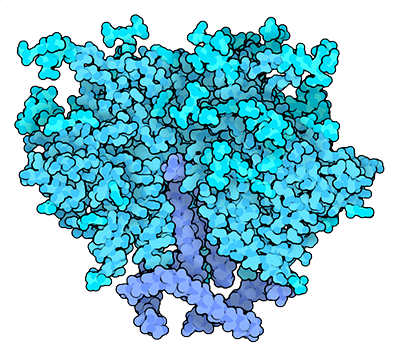 These structures are all publicly available in the Protein Data Bank (PDB) archive. Using these data, researchers have designed new treatments for HIV infection, including effective drug regimens that halt the growth of the virus. The structures also provide new hope for development of a vaccine. Click anywhere on the virus or choose a protein from the menu to beging exploring. 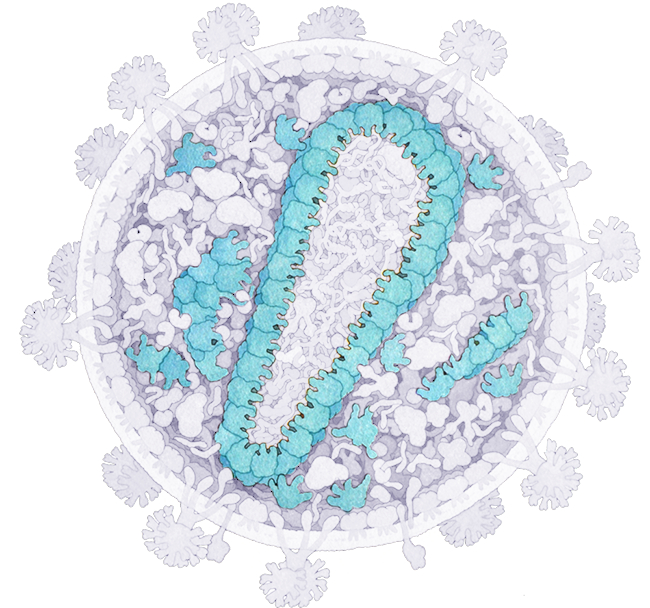 Envelope proteins gp120 and gp41 bind to receptors on the surface of cells that HIV infects, and then penetrate the surface to infect it with the viral RNA. The spikes formed by these proteins are highly decorated with carbohydrates, making them difficult to recognize by antibodies. 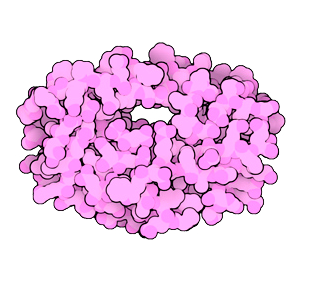 PDB entry 4nco includes SU and the portion of TM that is outside the membrane. Matrix protein forms a coat on the inner surface of the viral membrane. It plays a central role when new viruses bud from the surface of infected cells. 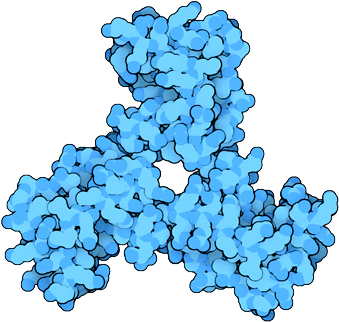 This protein assembles into trimers, which then associate side-by-side on the membrane. Capsid protein forms a cone-shaped coat around the viral RNA, delivering it into the cell during infection. It forms stable hexamers, which then assemble like tiles to form geodesic capsids. 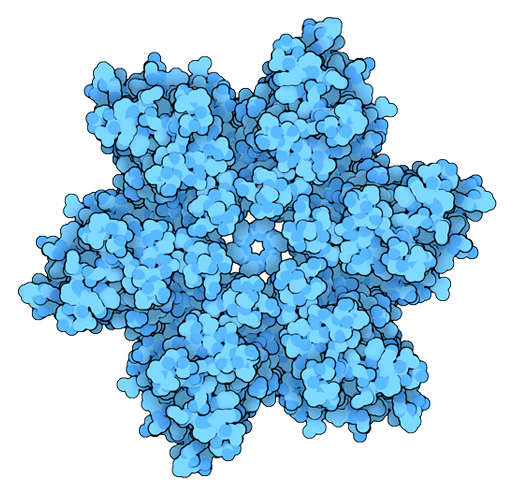 Nucleocapsid protein forms a stable complex with the viral RNA, protecting it. 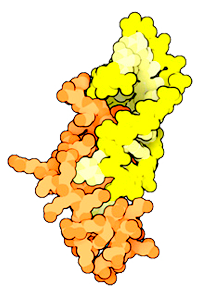 In this structure, a short piece of RNA (yellow) is bound to one copy of nucleocapsid (orange). Reverse transcriptase builds a DNA copy of the viral RNA genome, which is then used to build new viruses. 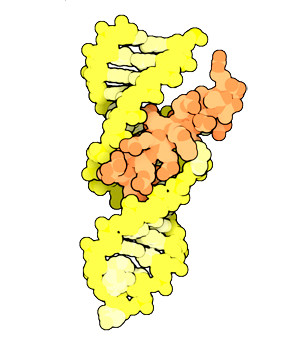 This structure captures the enzyme as it is building a DNA strand (red) from the viral RNA (yellow). It will then destroy the RNA and build a second DNA strand. 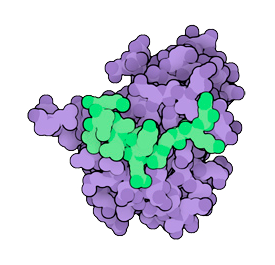 Many of the drugs currently used to fight HIV infection block the action of reverse transcriptase. Integrase takes the DNA copy of the viral genome and inserts it into the infected cellular genome. 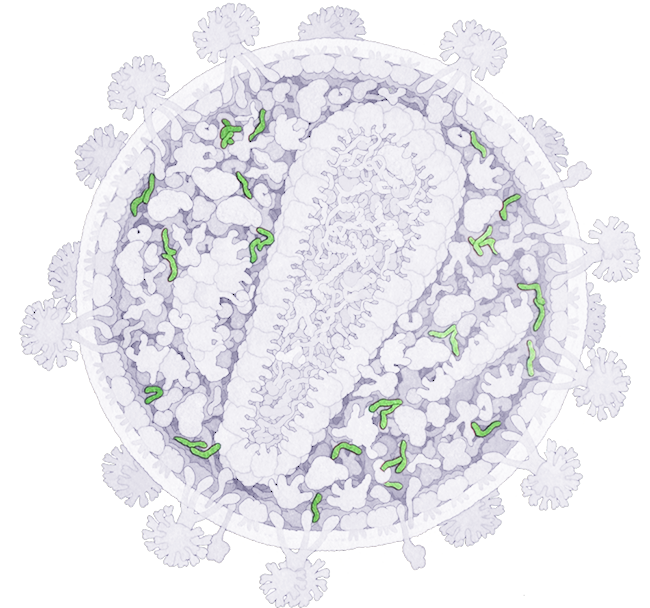 In this way, HIV can lie dormant in cells for decades, making it incredibly difficult to fight. Anti-HIV drugs that block integrase have been developed. ﻿HIV protease is essential for the maturation of HIV particles. The proteins in HIV are built as long polyproteins, which then must be cleaved into the proper functional pieces by HIV protease. 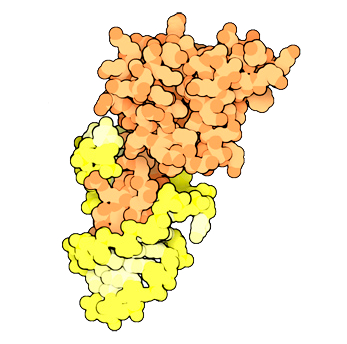 Protease inhibitors are widely used as anti-HIV drugs, often in combination with drugs that block reverse transcriptase and integrase. ﻿Viral protein u helps the virus escape the cell during budding by weakening the interaction of the new envelope proteins with cell receptors. It is not thought to be present in the mature virion. ﻿Viral infectivity factor attacks one of the cell's defense proteins, which forces the cell to destroy it. 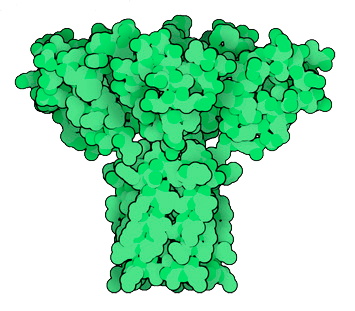 Only a small portion of Vif (green) is shown in this structure, bound to proteins from the infected cell (purple). 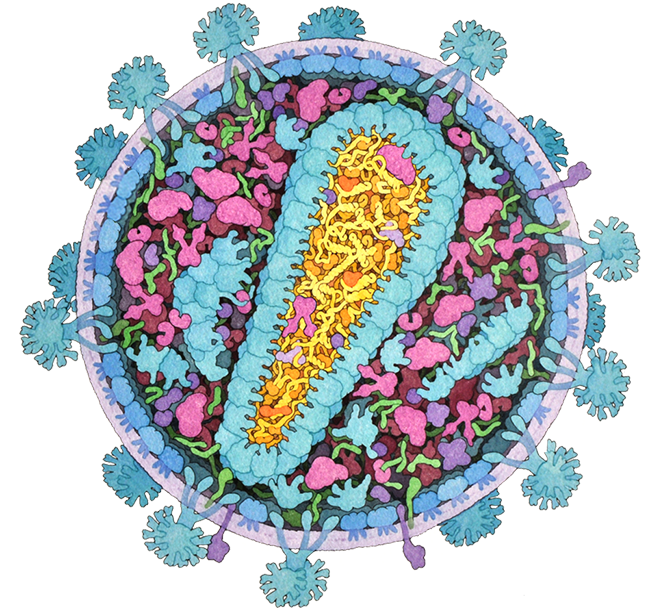 ﻿Viral protein r guides the viral genome into the nucleus following infection. ﻿﻿P6 is involved in the incorporation of Vpr into new viruses. It is largely unstructured and there is currently no structure for it in the PDB. ﻿Negative regulatory factor forces the infected cell to stop making several proteins that are important in cell defense. Nef is important in the progression of HIV infection to Acquired Immune Deficiency Syndrome (AIDS). PDB entries 1avv and 1qa5. ﻿Regulator of virion protein binds to a hairpin in the viral RNA and regulates the splicing and transport of viral RNA. 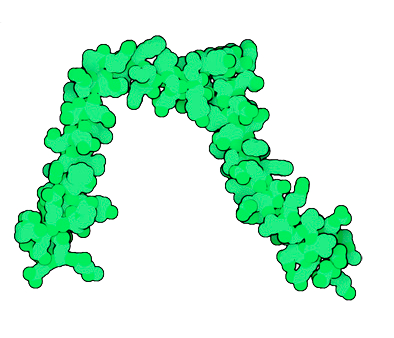 The structure shown here includes only the portion of the protein that is bound to the RNA–the whole protein is several times larger. 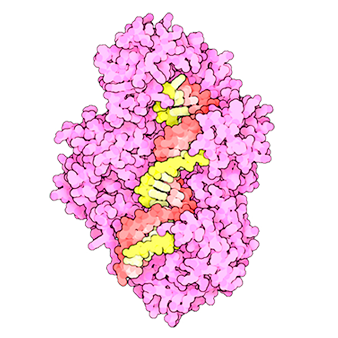 ﻿Trans-activator of transcription protein binds to a hairpin in the viral RNA and greatly enhances the amount of protein that is made. PDB entries 1biv and 1jfw. ﻿The genome of HIV is composed of two identical strands of RNA, each about 9700 nucleotides long. The genome encodes the information needed to synthesize all of the viral proteins. 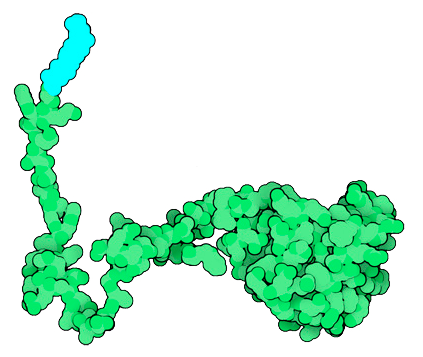 Portions of the genome also form hairpin loops that interact with the regulatory proteins. ﻿HIV is enveloped in a lipid bilayer that is taken from the infected cell when the virus buds from the cell membrane. 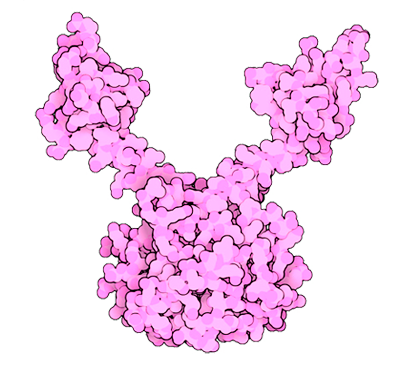 ﻿Several cellular proteins are captured when the virus buds from the cell surface, including cyclophilin A, a protein that assists the folding of proteins. Two molecules of cellular transfer RNA are also captured, which will be used to initiate the synthesis of the viral genome in the next cell that the virus infects.